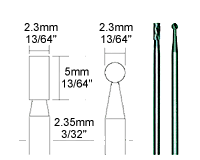 Accessories for rotary tools in dental and industrial quality: Milling Bits. Selected tungsten vanadium steel. Purposely made of stable construction with head and shaft out of a single blank. The precise flutes and optimal concentricity ensure best life expectancy. 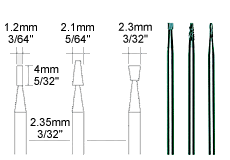 All shanks 2.35 or 3mm (3/32" or 7/64"). For use on hard and soft woods, non-ferrous metals and precious metals, as well as plastics and plaster of paris. 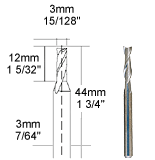 Ideal for milling, routing, shaping, profiling and slotting. 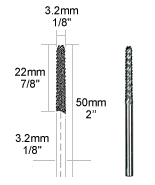 For clean and powerful fitting of the milling bits we recommend the use of MICROMOT steel collets. For working on extremely hard materials: steel, cast iron, non-ferrous metals, plastics. Vibration-free milling of high accuracy dimensions. Ideal for technical work, engraving or milling circuit-boards. 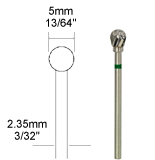 Shanks Ø 3mm (7/64") or Ø 2.35mm (3/32"). Note: Please make sure to clamp work piece securely when milling. Here also we recommend the use of MICROMOT steel collets. Tungsten Carbide. For cutting and milling tiles, stoneware, wood and plastics. Shank Ø 2.35mm (3/32").